Samsung is set to follow up its recently unveiled Samsung Galaxy Fold with more foldable phones – but they’re set to be quite different from the Fold. According to a report from Bloomberg, Samsung has two more foldable phones in the works, and is experimenting with different formats for the devices. Samsung clearly hasn’t settled on the Galaxy Fold’s book-style design as its definitive form factor going forward. The first of these foldable phones is said to be a “clamshell-like device”, which presumably would fold horizontally down on itself to close, like a clamshell. This could simply be a novel way of folding a tablet-sized device into a phone, or a way of shrinking a large smartphone to make it portable. The second device Samsung is working on is said to be a vertically foldable phones, like the Galaxy Fold, but an outwards foldable phones that, when folded, would have the screen on the outside. This design bears a resemblance to the upcoming Huawei Mate X, which also folds outwards, as opposed to the Galaxy Fold which collapses inwards. According to the report, Samsung plans to unveil the first of the device in late 2019 or early 2020, with the latter foldable phones following at some point after that. The Bloomberg report also cites one of the sources claiming Samsung is noticing wear-and-tear issues with the Galaxy Fold, suggesting that after roughly 10,000 folds creases begin to form on the panel, and that the company is looking at offering free screen replacements for people who buy the device. While 10,000 is a lot of folds, you’d only need to open and close the device 27 times daily for it to crease within a year (around 13 times a day over two years). When we get hands-on with the device we’ll see if there are any signs of this issue. 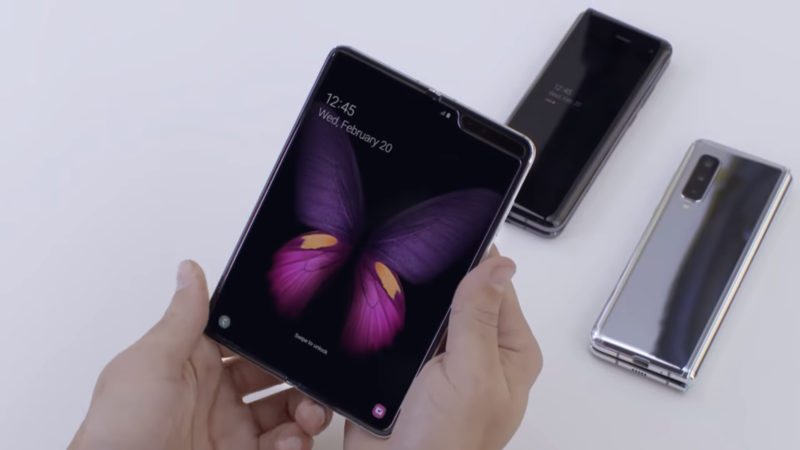 The Samsung Galaxy Fold is set to release in April, and it’s one of the first in a wave of big-name foldable phones that will hit the market in 2019. Check back when it’s released for our full review of the handset.